I've been holding this challenge in my consciousness lately. Doing something brave every day. Jumping through those moments where parts of me may be pleading to back away, maneuver around or completely ignore what it is that is causing my heart to race a little bit faster...pump a bit more excitedly at the thought of being brave. I think of it all in the very ordinary sense of a brave act. The things that present themselves to us on a daily basis. Things like reaching out to someone who we don't understand and searching for common ground. Being brave may look big or small, loud or quiet. It may be going to that event without knowing anyone who may be there. It may be making that phone call to the people who have hurt you and opening yourself up further. It may be signing up for a community service project or inviting someone over for coffee and chat. It might look something like jumping off the swing set after pumping yourself as high as you can go. It might be saying a goal out loud for someone or NO ONE to hear. It most certainly is making it up in your mind...whether within a long self-debate or a hot moment of high decision...to take the risk and to tread a bit closer to that place that looks scary. Sometimes I can't even let myself go to those places. They seem a bit too spooky. They require me letting go. They ask me to grow up...to wake up...to live. We all have our places. We all have ways of avoiding those places. I have plenty of them and I certainly can construct my life around avoiding those places at all costs. But sometimes, I do take the plunge. I double dog dare myself to go somewhere that scares me and once I am there...I convince myself to keep on going. It might be walking, it might be jumping, it might be skipping or taking itty bitty baby steps...but if I can manage to gently encourage myself to get through it, I come out of that place a different person. I gain a little more clarity, I make friends with the darkness, I sit inside of that darkness and notice that it isn't all that bad. It isn't all that scary. There is a certain amount of inescapable living that coincides with getting through. Whether that be a greater sense of self-love, a wider taste of freedom, or a deeper breath of peace...all of it somehow feels more alive and juicy than doing what comes easy. To me, lately it seems like when something starts to make me feel uneasy and unsettled...I know that there is some kind of teacher inside all of it. Not to say that I am always willing to be available for the lesson...but I am beginning to understand this simple thought: When we choose to be brave and approach what it is that makes us scared in an open, curious way...we usually come out of the experience gaining something that we never knew we needed (or something just as delicious anyway)! Let us be brave. i love it also, sass......putting ourselves outside our comfort zone...good for the ole heart to pump faster....and lets us feel new sensations and see new scenery....out of our rut! 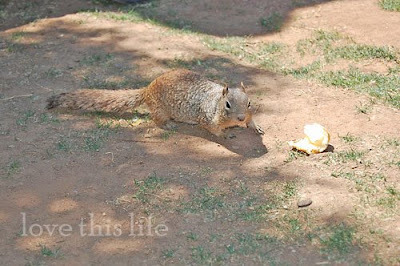 I think this little squirrel was much braver than we will ever be! :) j/k! Yes, let's be brave! karoake anyone?? Yes, I can relate to this. Forcing myself to step out of my comfort zone and going to places where I don't know anyone. 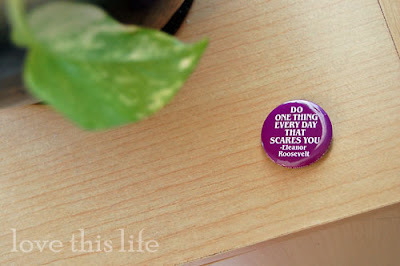 I love this post and think about this idea of having courage to grow quite often. I know it's important to always stretch beyond your comfort zone, and when I do I usually am happy for it--if only that made it easier to do! doing something that scares me is really hard. and always freeing. thanks for this reminder, that what scares me just may be the teacher I've been looking for.